NOCC is looking for young people who love to sing! Contact us at nocc787@hotmail.com or at 504 482-2883 for more information about ongoing placement hearings. We can accommodate singers ages 5-18 in several choirs which are divided by age and experience. NOCC finds a place for all kids who want to sing. Our 2018-19 season will include a tour to sing in Florence, Verone, Venice and Lake Garda, Italy for our older singers, as well as Winter, Spring and Broadway Concerts. The 20th annual Crescent City Choral Festival, sponsored by NOCC, is a festival for treble and mixed choirs. June 28-July 2, 2019. Find out more. Join the New Orleans Children’s Chorus on a 10-day tour of Italy! Visit Florence, Verona, Venice, and Lake Garda. 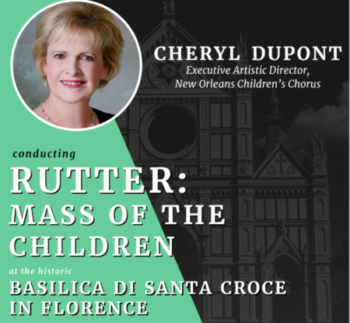 The tour includes a performance of John Rutter’s Mass of the Children in Florence’s Basilica de Santa Croce. Youth and adult singers welcome. Find out more. NOCC was originally affiliated with the New Orleans Symphony. The founding director was Susan Wyatt. Cheryl Dupont began directing the Youth Chorale in 1984 and the Concert Chorus in 1987. After taking over as director of the Children’s Chorus, she affiliated the two choirs and formed a non-profit corporation. Under her leadership the organization has grown to four ensembles for children ages 5-18, divided by age and experience. The NOCC choirs are the Concert Chorus, Lyric Chorus, Youth Chorale and Songbirds. The Concert Chorus is the main touring chorus of NOCC. The Concert Chorus has appeared at three regional conventions of the American Choral Directors Association. They have presented solo concerts at Carnegie Hall in New York City, performed at St. Peter’s Basilica in Rome, the Palazzo Vecchio in Florence, served as Artists-in-Residence at three universities and performed frequently with the Louisiana Philharmonic Orchestra and the New Orleans Symphony. The Youth Chorale has won numerous awards in music festivals throughout the Southern United States and performed several times at Carnegie Hall in New York. The Lyric Chorus has also toured North Carolina, South Carolina, Florida and Kansas. 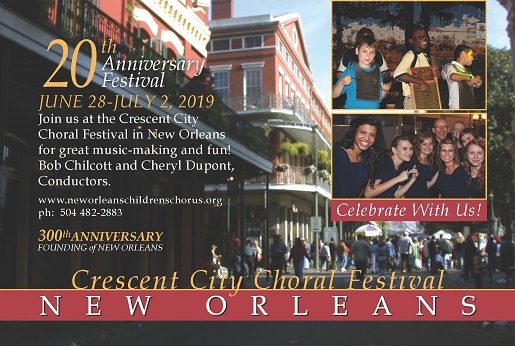 In June of 1999, NOCC sponsored the first annual Crescent City Choral Festival, which was held in downtown New Orleans culminating with a concert at St. Louis Cathedral. The festival featured ten children’s choirs from throughout the United States. Conductors were NOCC Artistic Director Cheryl Dupont and guest artist Moses Hogan. Subsequent festivals have featured the noted English composer, conductor and singer Bob Chilcott and Juan-Tony Gusman, composer and conductor from the Dominican Republic. In July of 2002 the Concert Chorus served as Young Artists-in-Residence at the Choral Music Experience International Millennium Festival at the National University of Ireland. In the aftermath of Hurricane Katrina, many choirs in North America contributed to the “Circle of Love” campaign spearheaded by Donna Thomasson of Atlanta, Georgia. Paul Caldwell of Chicago put together an online auction, mounted it on eBay with Dana Dupont’s help and raised significant funds for the NOCC operating budget. In the fall of 2006, Paul and Donna staged an additional fundraising campaign. Funds raised through this campaign were essential in helping us get through the 2006-2007 season. Without the tireless efforts and generous hearts of Donna and Paul and the generosity of countless choral teachers and their singers, it is unlikely that NOCC would be here today. We are deeply grateful for their love and support.